This is the most complete recently updated service repair manual for the Mitsubishi 3000GT VR-4 & SL covering years 1991-1997. It contains over 3000 pages of illustrations, tables and step by step instructions on how to repair and service your 3000GT. 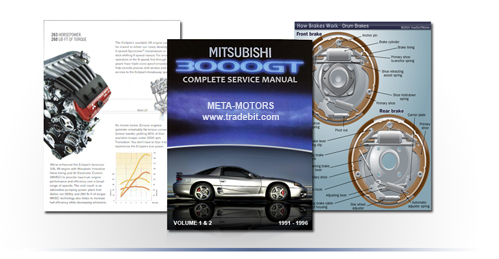 This manual only covers the 3000GT with full 2 Volumes plus bonus materials! Accessories Control Systems :: Communication Devices :: Cruise Control Systems :: Door Locks & Anti-Theft Systems :: Entertainment Systems :: Exterior Body Panels :: Exterior Lights :: Exterior/Interior Trim :: Frames, Subframes & Crossmembers :: Gauges & Instrument Panels :: Headlights :: Heated Glass/Defoggers :: Horns :: Interior/Illumination Lights :: Memory Modules :: Mirrors :: Paint/Coatings :: Seats :: Sun Roof/T-Top/Convertible Top :: Windows :: Wiper/Washer Systems :: Wiring System Data Link Connectors, Pwr Dist., Grnd Dist. Content: Color and B/W photos & illustrations. Delivery: Delivery: Download link will appear on the checkout page after payment is complete. This file is sold by meta-motors, an independent seller on Tradebit.